Lighting-fast, optimized repricing capabilities empower you to gain a competitive advantage and capture more Buy Boxes on every e-commerce channel you use. Our repricing methods help sellers not only capture more Buy Boxes, but maximize margins and gain better visibility into your competition. Create an always-on or conditional pricing strategy based on rules, algorithms, or sales velocity—then sit back and watch your sales increase. Never miss an opportunity to outperform your competitors. SellerActive’s repricing functionality provides you with precise Buy Box and sales analytics. Speed is everything in online selling. That’s why we work with Amazon’s API to deliver the most accurate pricing updates in seconds. Stay ahead of the competition and win the Buy Box more often. Our automated repricing methods tap directly into key e-commerce marketplace APIs to deliver tangible results. Capturing the Buy Box doesn’t necessarily mean offering products at the lowest prices. 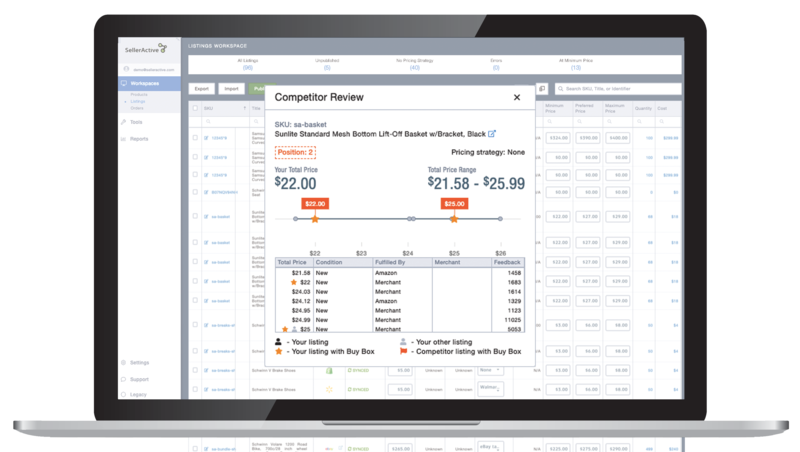 Take a smarter, more strategic approach to e-commerce competition with SellerActive’s repricing technology. Don’t have time to manually create a strategy for each of your products? Our self-learning repricing algorithms will discover and exploit your competitors’ shortcomings, so you don’t have to. 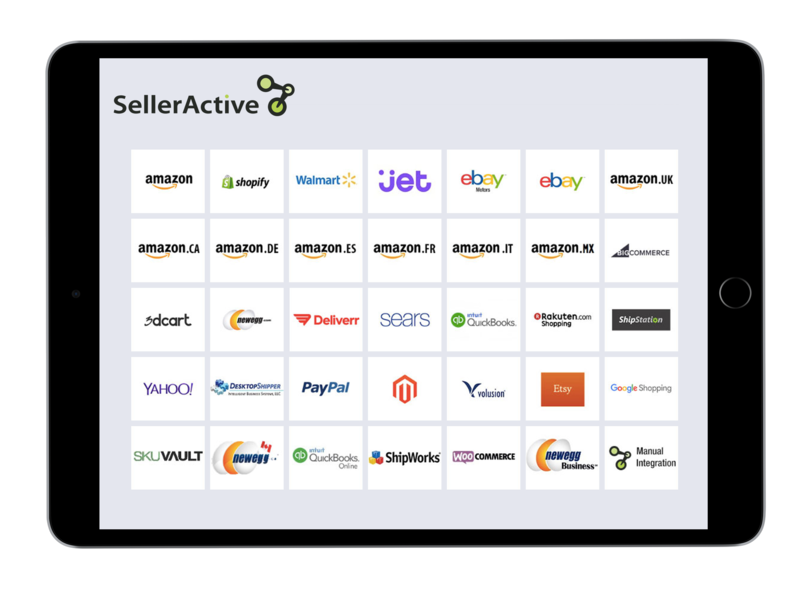 Unlike other multichannel e-commerce management platforms, SellerActive alters your prices dynamically and continuously, so your listings always remain optimized. Take complete control over your listings and prices. Set rules to optimize prices based on competitors, time of day, seasonality, and other factors—the rest happens automatically. Our repricing software will continuously monitor, report, and adjust prices in line with your predetermined strategy. Want more control over your business’s pricing methods? Tailor your pricing strategies to your unique needs, and we’ll put them into action. Receive notifications on competitor price changes as they occur in real time. Plus, our platform ensures you don’t miss a beat: we’ll updates your prices automatically, according to your unique repricing configuration. Exploit your competition to gain more detailed measurements about sales and boost your rate of success. Our repricing strategies take sales velocity and stock levels into account to determine the most profitable way to price your items. Do you have contingency plan in place when your pricing strategy can’t deliver results? Take advantage of SellerActive’s fallback pricing options, which allow you to immediately switch to a different strategy whenever you need to change course. Have a question about repricing? Looking for input from another e-commerce professional? SellerActive’s industry-leading team of customer support and implementation specialists is available to help. 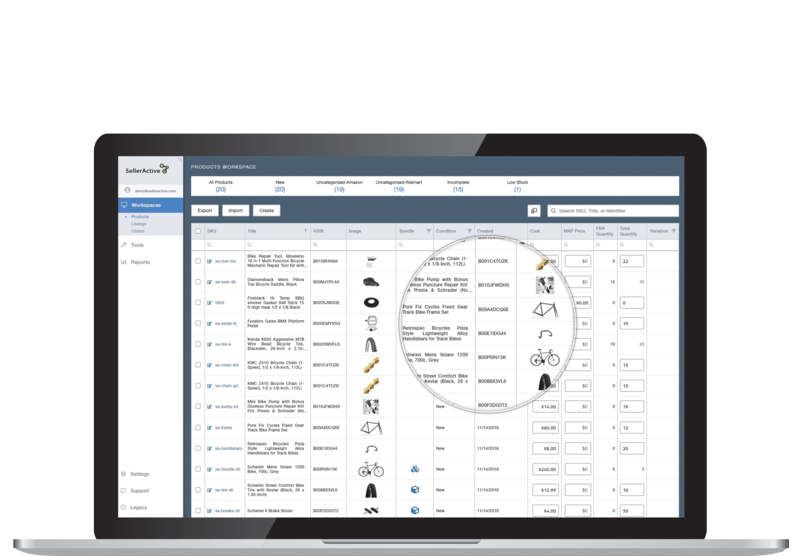 "Makes Selling in Multiple Marketplaces Easy As 123"
"The software truly updates inventory in real time. The listing feature is really awesome, can't wait for the new features for other marketplaces. The software has really freed up a lot of my time to do other aspects of growing the business." Winning Buy Box real estate is at the top of every Amazon seller’s mind, but that’s not the only thing it takes to make it as a successful seller on Amazon.